Hello! 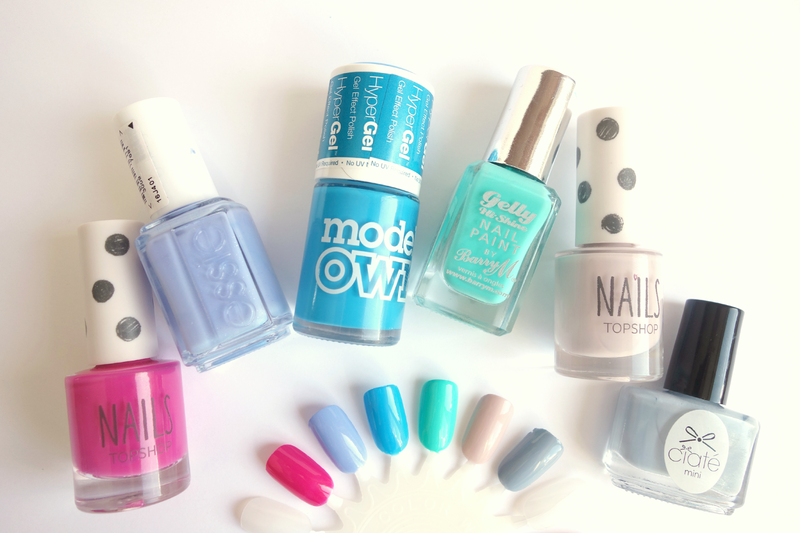 As a few new polishes have made their way into my collection, so I thought I’d round up my favourite Spring nail shades. Brighter colours are always perfect for summer, but including a few muted tones had to be done too, as I know some of you are more pastel gurls than neon! First is the wonderfully vibrant hot pink number by the name of Topshop High Voltage. Although it’s a recent acquisition, it’s got a firm place in my favourites as the shade is so lovely on! It may look like your standard pink, but in person it’s so much more intense. Perfect for Spring/Summer. Next is a blogger favourite, which is Essie Bikini So Teeny. This came out last summer (I think!) and I know everyone went crazy for it, which I can see why as it’s the nicest blue/lilac shade. It has a slight shimmer running through it and applies so nicely to the nails. It’s a shade I often reach for when I don’t know what to put on! I do love my cool tones, so adding a blue in here was always gonna happen. Models Own HyperGel Polish in Blue Glint (they’re on 6 for £20 at the moment too!) is such a lovely poolside blue shade. I love the formula of the HyperGel polishes as they last for quite a while and apply smoothly. I can never really go wrong with Models Own and this is no exception. Similarly to the previous gel formula, Barry M Gelly Polish in Greenberry is one of my all time favourites. It’s so bright and always looks nice on my nails. It’s definitely a shade I go for when I want my nails to have a bit more of an impact, as it’s such a great colour. Opaque in two coats, too. Next are two more toned down shades, starting with Topshop Ethereal, which is a super pretty light pink/lilac. It does lean slightly more pink (like the pink version of Models Own Utopia) and is a great pastel without being too sugary sweet. Finally, Ciate Chinchilla (bought via Fragrance Direct, they’ve got their Mani-Month Calendar on super cheap!) which is the most perfect light grey. I had this polish on for five days straight and there was only the most tiny bit of tip wear – impressive! I adore this polish and have a feeling Ciate are going to make more of an appearance in my nail polish drawers soon! No doubt they’ll be more of my favourite nail shades featured soon on the blog, as a polish addict there’s plenty for you all to see (two huge drawers full!) Are there any shades that you love at the moment? Let me know in the comments!